A podiatrist, also called a foot doctor of podiatric medicine, is a specialist who provides medical diagnosis and treatment of foot and ankle problems, such as bunions, heel pain, spurs, hammertoes, neuromas, ingrown toenails, warts, corns and calluses. 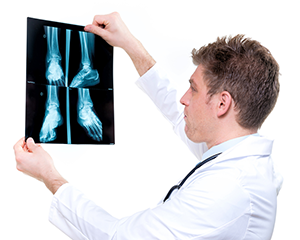 A foot doctor also renders care of sprains, fractures, infections, and injuries of the foot, ankle and heel. In addition to undergraduate medical school training, podiatrists also attend graduate school for a doctorate degree in podiatry. Podiatrists are required to take state and national exams, as well as be licensed by the state in which they practice. According to the American Podiatric Medical Association, there are an estimated 15,000 practicing podiatrists in the United States. Foot Doctors are in demand more than ever today because of a rapidly aging population. In addition, according to the association, foot disorders are among the most widespread and neglected health problems affecting people in this country. For more information on our Foot Doctors in the Virginia Beach, VA area call Cho Foot & Ankle Specialists at (757) 427-7447 today!